Political parties and feminism sometimes seem to be an uneasy match. It's extremely rare for politicians, even very pro-woman ones who work for feminist issues, to raise the "f" word, because the label is seen as divisive and dangerous. Popular conceptions of feminists as man-hating, bra-burning harpies have led to politicians striving to stay away from the word like the plague or a bad poll result; no matter how glam Taylor Swift or Beyonce make feminism look, it's still got an uneasy location on the political landscape. After all, we still live in a world where the leader of a legitimate political party in Poland can say that he doesn't believe women should have the right to vote, and where comedian Cecily Strong has to get journalists to raise their hands and swear that they won't comment on Hillary Clinton's appearance during her 2016 presidential campaign. Luckily, feminists around the world have taken matters into their own hands and formed their own political parties. The idea of the mainstream political party with a strongly feminist agenda has been percolating for a while. The worldwide political landscape is littered with abortive attempts at feminist party-making that surged with popular support but failed to gain any traction with voters, and fell into obscurity after a few elections; Australia's What Women Want (2007-2010) and the Belarusian Women's Party (1994-2007) are examples. Others, like Iceland's Women's List, formed alliances with other parties that split the original members (it was absorbed into the Social Democratic Alliance in 1999). But it's only recently that openly feminist parties have been grabbing headlines in elections, and the time may be ripe for them to start building power bases. Here are six feminist political parties — parties which were founded explicitly to further women's equality and freedoms in society, and who often aren't scared to use the "f word" to describe themselves — that you should know about. This is the one that's been getting the big headlines. The Feminist Initiative originated in Sweden in 2005, and has been mounting ever since; it garnered itself an MEP in the European Parliament in the 2014 election, Soraya Post, with 5.3 percent of the vote, and despite a less impressive performance in 2015, has sufficient popularity to expand to Norway. A 27-year-old, Cathrine Linn Kristiansen, will be standing in Oslo for the Feminist Initiative. The party's main slogan in English is "Replace racists with feminists!". It's been criticized for being a one-issue party, all about the academic nature of feminist theory and not about figuring out economic policy or immigration — but it's certainly making a splash. Check out their manifesto here. The Women's Equality Party is a new one in the United Kingdom — so new it only announced its own existence on May 2 — but it's got a pretty solid running start. One of the founders is a British celebrity, TV host and comedian Sandi Toksvig, who's said the party "is a fantastic group of women — and indeed men — who have decided that enough is enough and we need to make some changes." (It's probably no coincidence that Toksvig comes from Denmark, with Scandinavia being such a hotbed for this sort of thing.) Its platform includes education, equal pay, parenting rights and ending violence against women. GABRIELA is badass — there's no way around it. It's the political party that represents a huge group of women's organizations who describe themselves as a "militant women's movement," and as a political women's alliance it had a pretty tumultuous start: it began after 10,000 women led a mass protest in Manila in 1984, which was at that time against the law of the autocratic state. The group's current member of Congress, Liza Maza, has authored bills on rent control, anti-torture, the Magna Carta of Women, and narrowly avoided being arrested when the country was still ruled by the Marcos family. 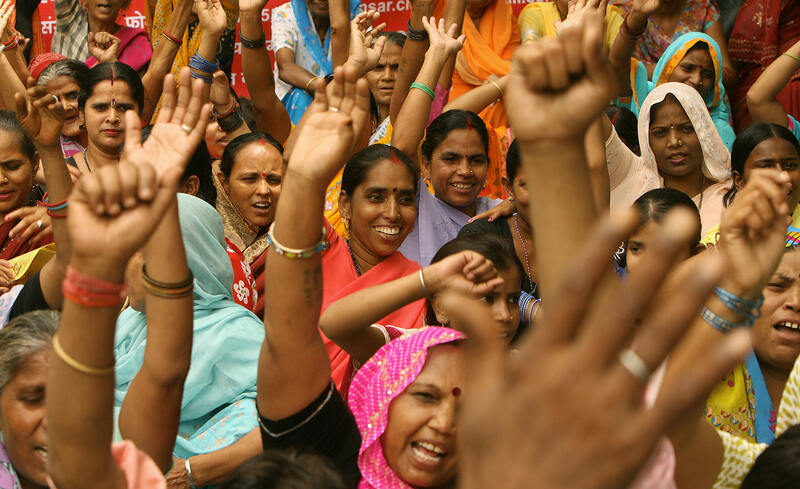 The United Women Front is one of several women's parties in India, and it got a lot of publicity when it launched in 2007, founded by prominent activist Suman Krishan Kant. Kant also founded Mahila Dakshata Samiti, an organization for advancing the rights of Indian women and children, and the UWF is along the same lines. The sheer scale of women's inequality in India appears to have been holding the UWF back from achieving big dreams in politics, but its Facebook page shows that the party is doing grassroots work on domestic violence and women's health. Never heard of the Peace And Freedom Party? It's not surprising; this group, made up of feminist socialists, are the essence of a passionate minority party. It emerged in 1967 as the nation revolted against the Vietnam War, and has gone on to maintain a left-wing agenda on ideas such as nuclear waste and environmental protection, plus a feminist position on wage equality and domestic violence. In 2012, Roseanne Barr was their candidate for president, with prominent anti-war activist Cindy Sheehan (who also ran against Nancy Pelosi) for vice president. Israel shook things up in March 2015 with the announcement of the first ever Haredi Orthodox Jewish women's party, U'Bizchutan. Haredi is a strand of Orthodox Judaism characterized by its extremely traditional, non-secular views, and separation of the sexes in places like public transport. The founder of the party, Ruth Colian, said that the party needed to exist because "haredi women have no representation at all. There are male haredi representatives, but they do not address the needs and concerns of haredi women." Colian isn't to be messed with: she went all the way to the Israel High Court to declare gender discrimination by political parties illegal, after the Shas Party, another ultra-Orthodox party, refused to let her on its ballot because of her gender. She lost, but is still committed to fighting against discrimination across Israel and the Haredi community.